When the Biomedical Engineering Society team posted the video of their talking dog collar project inspired by Disney-Pixar’s “Up”, they never expected it to go viral. 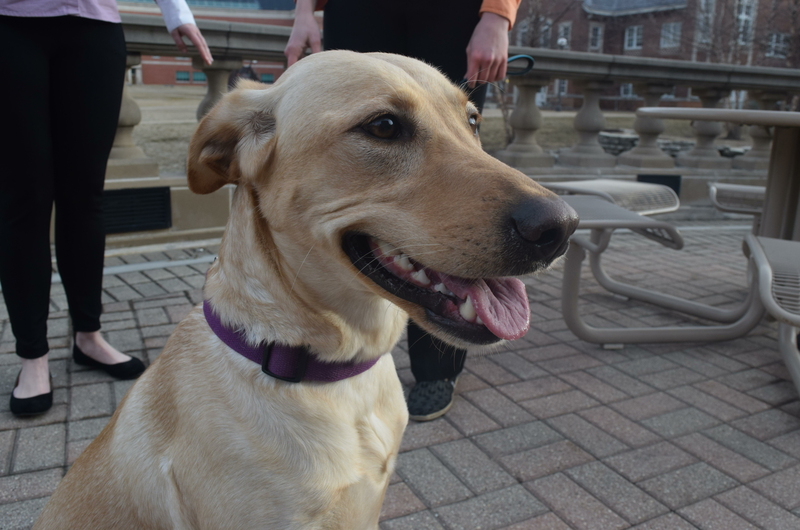 Before all the media attention began, the team of eight engineering students joined together under their common passion for engineering, teamwork, and —of course— dogs. 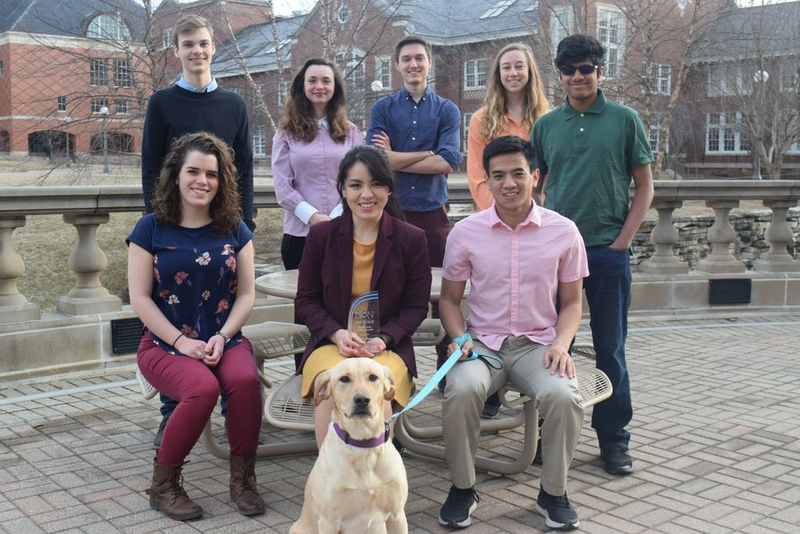 The College of Engineering sat down with the team’s leadership to talk about how their EOH winning talking dog collar came to be, how it works, and their experience working together on what they love. Q1: In simple terms, how does the device work? JA: Your brain has electrical signals that can be read in the form of EEG or electroencephalography. Those come from the neurons in your brain. We read those using electrodes that we 3D printed, and the purpose of that is to try to read Alma’s signals so that we can figure out how she responds to a stimulus. AM: So the first component of that is the electrodes. Those are very expensive, so we decided we should 3D print them instead. We 3D printed them in the Innovation Studio just out of plastic, and then to make them electrically conductive we coated them with this nickel paint, which conducts the electrical signal from the brain. Everything on the collar is sewn, Velcroed in, some hot glued in, but all the circuit components are connected externally to the collar. The electrodes are connected through wires to the circuit. A lot of people were freaked out about the EEG being harmful in come way to Alma, but it is not. It’s just plastic and it is optimized to be the most comfortable and fit to Alma to get as close to the skull as we possibly can. We tested it on Matthew and he’s fine. MD: The signals from the brain are on the scale of 10-30 microvolts, which is really, really small so we need to amplify that to actually read it into our computer. My job as the hardware lead is to create an EEG circuit. First we have an instrumentation amplifier, so what that does is, firstly, it protects Alma by stopping current flowing to the device and back to Alma. It’s not voltage that hurts people, it’s current that hurts people, so by stopping that it makes it completely safe. After that, we have a 60 hertz notch filter. A lot of that electrical appliances that we have and power lines function at about 60 hertz, and our device is sensitive enough to pick that up amplify it really well, so we wanted to knock that all down. So that filter gets rid of all 60 hertz noise. After that we have two high pass filters and two low pass filters. High pass filters, they let all frequencies that are above a set range through and below a certain range out. Similarly for low pass filters, they let lower signals through and get rid of higher frequencies. We ended up with our circuit amplifying all the signals and cut off frequencies below 7 hertz and above 30 hertz. That way we have a nice signal that we can send to our computer. JA: The signals that were between 7 and 12 were alpha waves. Alpha waves are your relaxation waves. When you’re relaxed they’re high. Then beta waves are 12 to 30, so that’s why picked that range. Beta waves are when you have motor function and are moving around, so that’s a solid area for us to investigate, especially based on past projects and research. BC: After Matthew does the heavy lifting of cleaning up all the data that Amanda’s electrodes have gathered, my job is to try to tease apart the data mathematically into two groups based on whether we think a stimulus is present or not. In the case of Alma, what we’re trying to do detect based on her neural activity, whether she sees a treat or not. Basically, we collected a whole bunch of data of Alma seeing treats and eating treats and a whole lot of data of Alma just doing everyday stuff. We looked at the data set, and analyzed the frequency domain, and tried to pull apart the data and see what parts are actually different between the two data sets. We used a couple different algorithms to do that. We started with something called logistic regression, moving up to support-vector machine, and we ended up at something called a deep neural network, which is tries to separate the data into two classes. One class is baseline, which is nothing going on, the other class is when Alma see a treat. Based on the results of that model that we built, we hooked the whole system up on Alma, and we tried to predicted based on her neuro activity, whether or not she’s looking at a treat. If we see her neuro activity looking at a treat, we play a prerecorded voice message out of the speaker. Q2: What other sort of experiments did you do during development? MD: Bliss connected me up using the electrodes and I would do different things. I was closing my eyes and comparing that to whether I was blinking or not. My favorite one we did on me was one where I was listening to music. We compared me closing my eyes versus listening to “Highway to Hell” very loudly. That was very interesting because the data we got wasn’t very good. So that tells us that there is not very much difference between my normal brainwaves and listening to heavy metal. Essentially, Alma likes treats more than I like heavy metal. Q3: Where did this idea come from? How did the team come together? JA: I’ve been working on EEG projects for the past four years, three of those in EOH. We used to use EEG to play video games. Freshman year we played Pong, where we put the electrode on a person and every time they thought really hard the pong paddle would move up. The next year Matthew and I lead a team that played Galaga. These both combined EMG, which is muscle movement, and EEG. In Galaga, flexing right was going right, flexing left is going left, and thinking was shooting the laser. I realized the most interesting part of both of these was the brain part. So last fall I was considering if I wanted to do another EOH project, and decided yes, but this time to use a dog. With my past experience and doing some research online, I found information about 3D printed electrodes, but I couldn’t find anything about talking dogs. This all just lead me to thinking about making a Dug the dog collar from “Up.” A few days later, Bliss texted me about doing a project together, and I was like “yeah, want to make a talking dog collar with me?” We then added in Matthew because he had four years of EEG experience. We also needed someone with strong 3D printing and CAD experience, so we recruited Amanda from BSME. We have four more team members that all contributed different things and were integral to the project. BC: I actually met Jessica at EOH when I was still in high school. JA: We were playing the Pong game and you came up to me and were like “explain your project!” Then I told you what it was. You added me on Facebook, we became friends. And we both like neuroscience so we became friends over that. Q4: Where did you start and how did you get inspiration? AM: So there was research we found, but a lot of it was just EEGs with people. There was one paper with information similar to what we were doing. They had a bunch of dogs that they trained for about a year and a half and they had them sit and wait and showed them images. That gave us information. And our team member Christine found the paper that was the initial base for the electrodes. MD: My EOH team last year tried to build an EEG off a tutorial online. We did it to the letter and nothing worked. This year I took that tutorial part by part to see which one wasn’t working. I found I couldn’t get the specific 60 hertz notch filter that they had in the design to work. I took that out, kept the high and low pass filters, and that was fine. I added my own 60 hertz notch filter that was passive, and it worked better for us. The only other modification I made was that we needed an inverting amplifier. The circuit as is sends us a negative signal, so it’s all negative voltage. Our computer can’t read that. So I learned in some of my ECE and BioE classes that the inverting amplifier will flip our signal to be the opposite sign that it is. It turned out really well. BC: From the software side, we didn’t have data to work with from Alma until the very end when it was all built. We found some information online that other scientists have open sourced related to people using EEG to classify things like trying to reach out and pick up a cup. We downloaded that data and played around with different algorithms to see what works with EEG data and what doesn’t and got an idea of what kind of techniques to apply. JA: We couldn’t really find much data about live EEGs of dogs, so when Bliss went looking for data sets, we couldn’t find much. We had to be creative and use human data. We did find some data about using dry electrodes because usually electrodes are wet. I volunteered in a study to do personal research, and they have to use a lot of solution and we didn’t want to do that. There was a paper published by people at Beckman about using dry electrodes, so we know it’s possible. The main thing is that there is not a lot of dog data online. There is some of some Beagles that went through MRIs because they were having seizures. Other than that there was nothing about healthy dogs. A lot of it was being creative and pulling together to find solutions. Q5: What is the biggest struggle you’re overcoming? JA: When we released our original video, and the media blew up, it was unexpected. Something we began to notice during this process was that the media was mis-portraying our project. Many of the outlets picked up the story, and focused singularly on Bliss as the leader and the person who built everything. This idea aligns with the classic stereotype of an engineer—a white male who works alone on an idea, but this was simply not true. The project was a result of multidisciplinary collaboration. Our team is diverse in ethnicity, gender, and backgrounds. I contacted Bliss about the misrepresentation, and we had a productive, healthy discussion about how we wanted our story to be portrayed. We developed a strategy moving forward to fix the way our project was portrayed. One of the decisions we made was to include Matthew and Amanda and the rest of the team in the interviews and the press. We want people to know the diversity of our team. Anyone that wants to be an engineer can be an engineer. We hope that through our efforts, the media coverage will reflect this message. Q6: You’re all upperclassmen. How has your Illinois education helped you get to this point? JA: One class that I took that I believe is unique to Engineering at Illinois was ENG/TE 333, or “Creativity, Innovation, and Vision.” That class stretched my mind and taught me to utilize my knack for ideation. One of the assignments we had in class was to write over 200 innovative ideas to improve the world around us. I think the skills I learned in that class, along with my past experiences with EEG projects at U of I’s EOH, truly helped formulate the vision for this project and gave me the confidence in our ability to succeed in such a wild venture. MD: At my very first EOH, I was working with a similar project with Jessica, but as a regular member and not a lead. I was completely clueless about what my upperclassmen were doing: messing with circuits, talking about Fourier Transforms, etc. I could barely keep up with everything that they were telling me. However, I realize now just how far I’ve come since freshman year: I built an entire circuit that can read brainwaves! Crazy right? In my 2-3am nights staying up to work with Bliss, I would look at a problem and think ‘Ok, I know what the issue is here. I dealt with something similar in my other RSO and my lab.’ or something like ‘Oh! I learned how to fix this problem in BIOE 415/ ECE 210.’ This project really gave me a good perspective on just how much I’ve learned here at Illinois through my classes and experiences, and it showed me just how fun applying knowledge could be. BC: Since spring 2018, I’ve been working on statistical neuroscience research with Professor Sanmi Koyejo in the CS department. These projects have challenged me intellectually far beyond any of my coursework and have been crucial to my educational experience at UIUC. I can’t tell you how many times I’ve wrapped up a discussion and had to sit down and immediately read 10-15 research papers just to understand what the meeting was even about. After much repetition, you become comfortable with the process of being totally lost and aggressively learning new things and soon enough it becomes habit. To echo Jessica’s sentiments, creativity and ‘being comfortably lost’ ARE skills and my Illinois education has helped me develop them. Q7: What advice do you have for other students looking to make their dream project a reality? JA: The most important part to a successful project—whether it’s personal, academic, or a startup—is the team. Your team chemistry, communication, and alignment will determine whether your project is a success. For Alma the Talking Dog, we had the perfect team. Everyone communicated smoothly, conflicts were resolved quickly, and we each had a necessary skill to bring to the table. When you feel every person on the team is necessary for the success of the project, you feel a different type of success. You know that with those around you, your dream project is bound succeed. It’s the coolest feeling. So, if you have an idea or a dream, find that perfect team, get them on board, and pave the way. Q8: What is the one thing you what people to remember about your project from this EOH? JA: People often have the misconception that engineers are antisocial or singular “inventors” working long hours in a lab. Although we might still work long hours in a lab, we want people to remember that for our project, as well as many other engineering projects, our project was a team effort. We had people from many disciplines with diverse skillsets and backgrounds all working on the project. Our team had bioengineers, a statistician-computer scientist, a mechanical engineer, and a pseudo-electrical engineer collaborating and innovating together. That team effort is the formula to the realization of our project. Moving forward, the team plans to from a registered students organization and are accepting applications to be on the team. For more information on this story, contact Miranda Holloway by email (mwhollo2@illinois.edu).